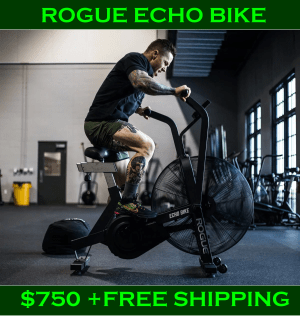 Rogue Fitness Sale Alert! 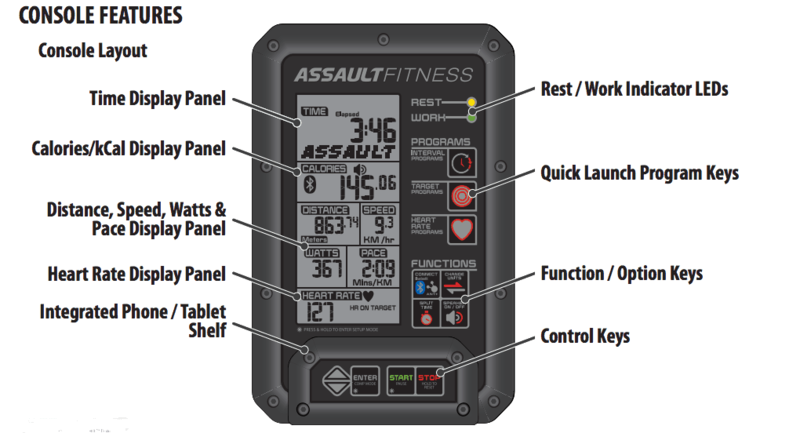 Rogue Fitness has the Assault Fitness AirRunner Treadmill on sale now for $3,699.00 - for a limited time. 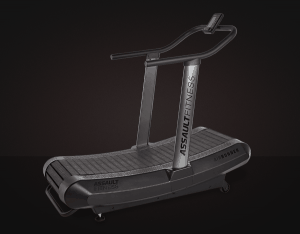 The Assault Fitness AirRunner treadmill is a motorless treadmill that burns calories and enforces efficient running form. 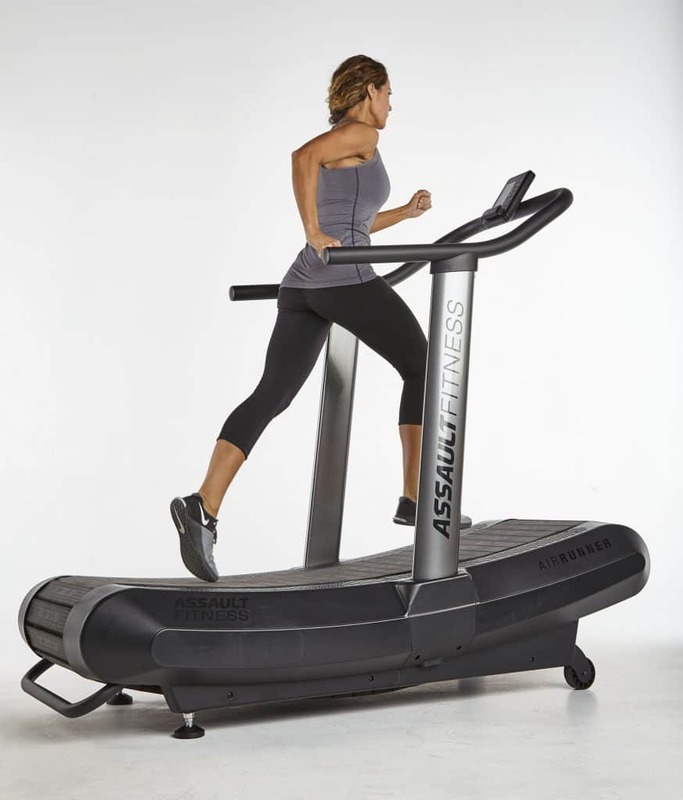 This manual treadmill is built by an innovator in fitness products – the same company who created the Assault Fitness AirBike – which is very popular in CrossFit. We’ll tell you why this treadmill is so much different than your average treadmill. 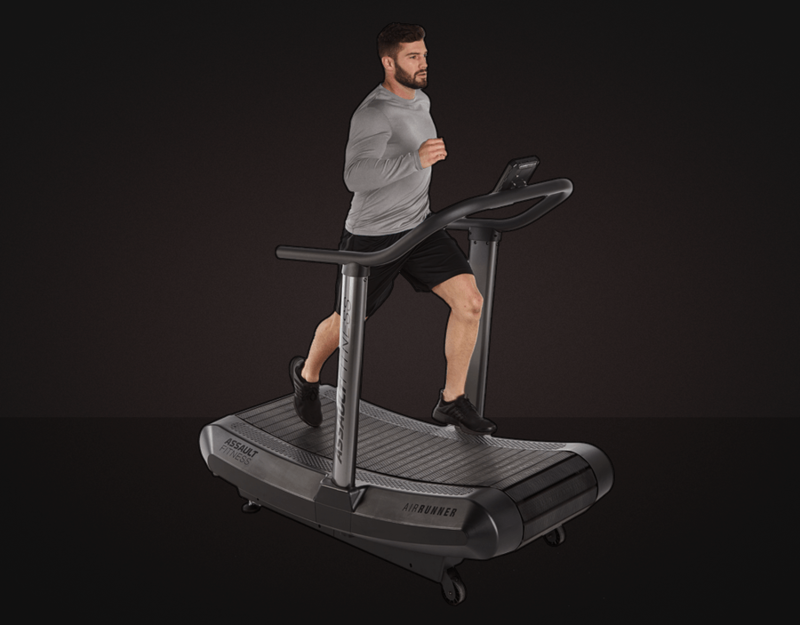 Looking for Black Friday 2019 sales on curved treadmills? 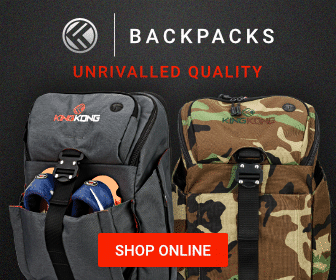 Check back here the week of Black Friday for our recommended choices and deals. Black Friday is the best time of the year to buy fitness equipment. 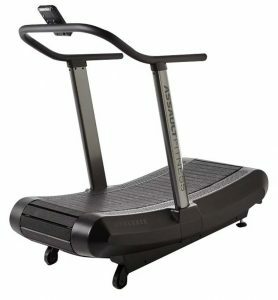 Why use a manual or motorless treadmill? The treadmills you have used in your local gym are usually motorized. You set a speed, and the device forces you to keep it. Quite frankly, that electric motor is doing a lot of the work for you, you just need to keep up. Used AirRunner for Sale? The AirRunner is expensive, commercial quality equipment. Your chance of finding one for sale used is minimal. 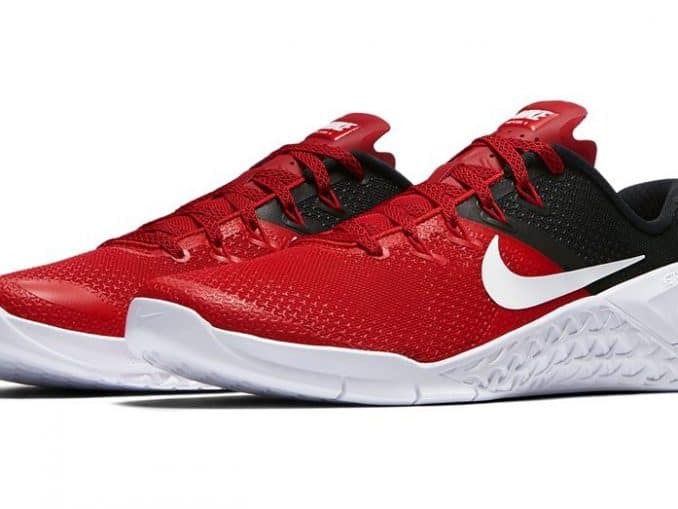 However, when these are used for the CrossFit Regionals or CrossFit Games, you’ll often see some pop-up on various websites. If you do find one, grab it before it is gone! A manual treadmill (also called a motorless treadmill) has no electric motor. The movement of your feet power the device. This offers a significant boost in calorie burning (up to 30%) over motorized treadmills. Some people also believe it helps enforce proper efficient running form much better than a motorized treadmill. 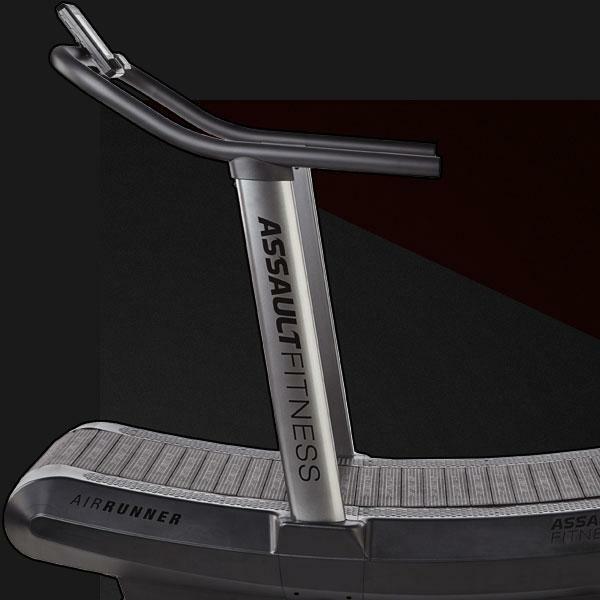 And Assault Fitness claims that the AirRunner is the most bio-mechanically correct treadmill, and this will enhance your overall running experience. And whether you run or walk on this treadmill, you’ll get a great workout in an efficient fashion. First of all, the most important feature of this treadmill: The curved running surface. In a nutshell, this is the secret to allowing the user to speed up or slow down at will. And this is what also makes this an exceptional interval training tool. Remember, there is no motor. The force of your foot against the running surface is what propels the belt with your stride. And that’s why this burns more calories when compared to a motorized treadmill. To speed up, simply start running, to slow down, allow yourself to drift down the curve. Body position and gravity take care of the work for you when slowing down. This sort of curved treadmill encourages a “under and behind” ground contact with the feet. This type of running form has been shown to reduce impact forces. 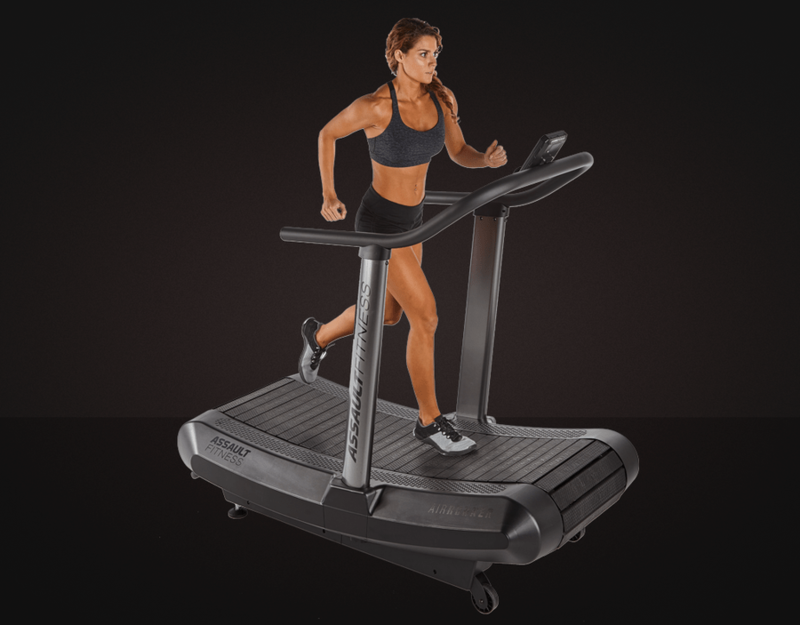 This treadmill encourages good running form – and that has a high level of carryover to outdoor running. The low-friction belt that provides the running surface is shown below. 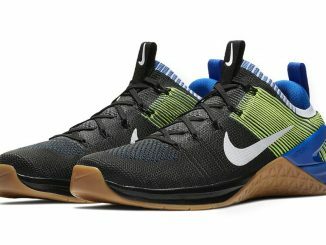 It’s tough and expected to last 150,000 miles of running usage. There are 122 roller bearings used to ensure that the unit works smoothly. It’s very efficient exercise, with a minimum of equipment maintenance as well. Why Use An Indoor Treadmill? Normally, I’m not a fan of running on a treadmill. It feels weird and the scenery never changes. But the AirRunner is different – you feel like you are working hard – and it’s an intense workout. It does take more effort than a regular treadmill. But honestly, do you want to spend more or less time on the treadmill? I’d rather get the work in and be done with it, personally. Also – consider the weather conditions outside – when it’s snowing (or roads are icy), raining, or just plain too hot – it’s best to run inside in the A/C. Personally I am also conscious of air quality while running. Running indoors prevents inhaling roadside exhaust fumes from cars. Is this device expensive? Yes. But it’s a good piece of equipment. 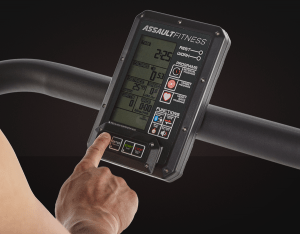 As you would expect with any modern cardio equipment, the AirRunner has a great LCD display that helps you keep tabs on all the key metrics of your workout. The LCD display itself is built for high contrast with improved readability, as compared to previous versions. What else can you do with the console? You can keep an eye on various metrics including: Watts (Power output), Heart Rate (you will need an external heart rate tracker with transmitter), Speed, RPM, Distance, Time, and Calories. You can easily change the distance and speed outputs from kilometers to miles. For connectivity, the unit supports both Bluetooth and Ant+ technology. Perhaps most importantly, the console can provide programmable workouts – such as HIIT and heart rate training programs. As we mentioned above, the AirRunner is self powered, but you do need 4 AA batteries for the LCD display. Let’s focus on the program modes available in the LCD console. This gives you an idea of some AirRunner workouts you will be able to do. The Quick Start program option is for users wishing to bypass the on-board programming setup steps and begin their workout immediately. You simply get on the device, hit Start and being running. Interval (HIIT, Tabata) style training is easy on an AirRunner. The Interval 20/10 and Interval 10/20 programs offer the user a series of eight high-intensity workout intervals with preset time segments. This training protocol is commonly known as Tabata. The console will provide messages to the user at start of each work and rest interval. Additionally, work and rest intervals will be signaled via flashing the on-board LEDs and audible tones. The user can choose between 20 seconds of work, 10 seconds of rest, or 10 seconds of work, 20 seconds of rest. If you don’t like those options, you can also program your own custom intervals. It should be noted that it is a lot harder to do Tabata intervals on a motorized treadmill. You just can’t speed up or slow down fast enough – and you have to fumble around with the controls while you do so. An all out sprint followed by complete rest for 10 seconds? That’s easy to do on the AirRunner. And this is one of the reasons why we like this treadmill better. The Target Time, Target Distance and Target Calories programs each operate in an identical manner. For these programs, the user may set a single target metric value and the program will continue until that goal has been achieved. The Target Heart Rate Program offers users the ability to target a specific heart rate / Bpm (Beats-per-minute range) or heart rate zone for maximum cardiovascular training. With one piece of information (user age), the console will automatically calculate the Estimated Calculated Maximum Heart Rate as well as some common heart rate training zones (65%, 75% and 85% of Max Bpm). 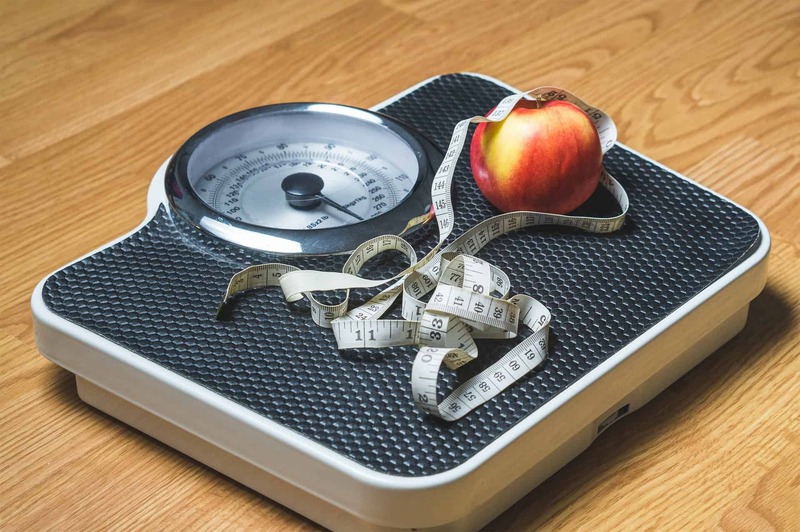 The Comp Program allows the trainer or user to set a pre-defined workout program targeting a Caloric, Time or Distance value. The Comp Program operates similar to the Target Programs with some key differences. While the console is in the Comp Run Mode, all other program functions are locked out to ensure the identical program settings are repeated and unchangeable. This feature is useful for a class setting or a head-to-head competition. This is a heavy duty piece of equipment. Made from powder coated steel, it weighs in at 280 lbs. 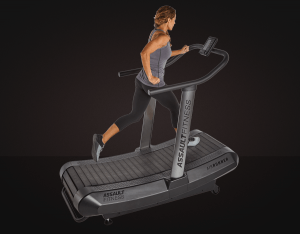 That’s actually pretty light for a treadmill – in fact, this is the lightest manual treadmill made that has a 33″ width. It also has a handle and transport wheels built in. 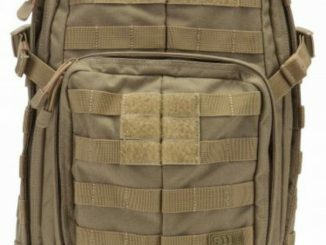 This allows for easy re-positioning of the unit whenever you like. 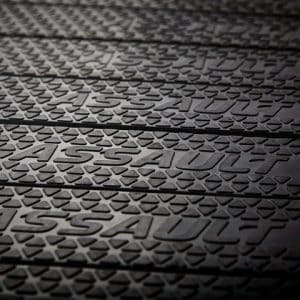 The running surface itself is 17.1″ wide. How much space does it take up? 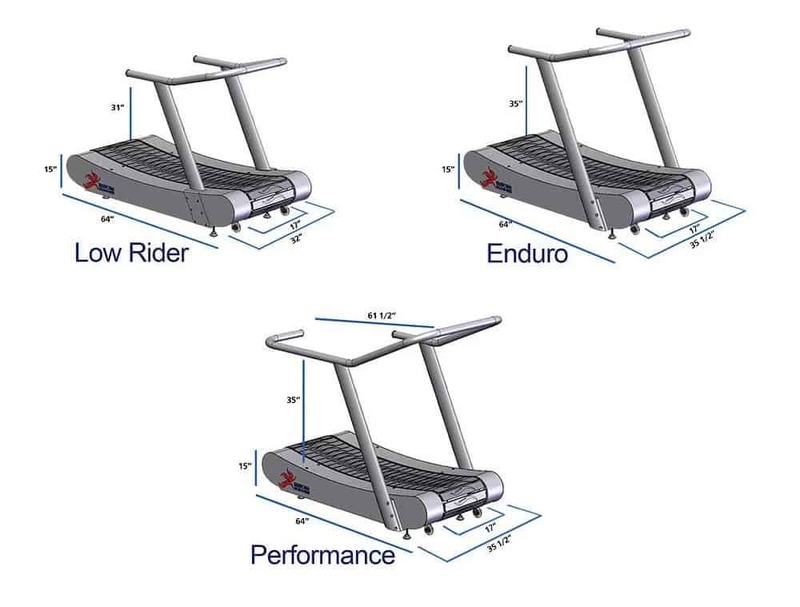 Here’s the AirRunner specifications, including the dimensions. One thing you might be wondering – just how fast can I run on an AirRunner? The answer is there is no speed limit – it’s really only a question of how much you can take. 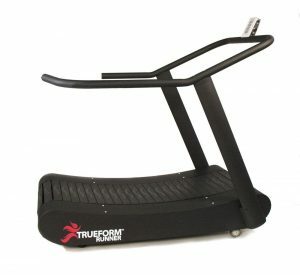 Rogue Fitness also sells the TrueForm Runner Treadmill. 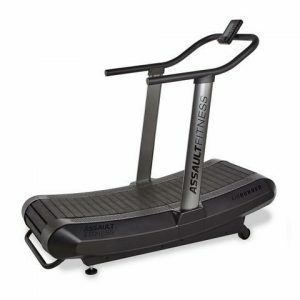 The TrueForm Runner is another high quality, curved treadmill unit. Both are very similar from a functional perspective. 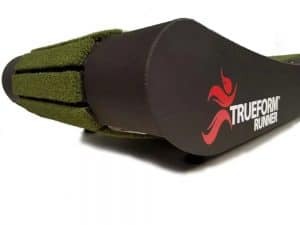 Please note that the digital monitor unit for the TrueForm Runner is an additional option. However, the TrueForm Runner also has options for different running surfaces, such as Green Field Turf (as shown here) and Red Running Track. Low Rider – Compact unit features a low handrail to help athletes sustain balance without the aid of leaning on the rails. Enduro – Standard handrail height, preferable for runners rehabbing from an injury or requiring the extra balance assistance of the higher rails. Performance – The most advanced TrueForm Runner model includes a tethering system ideally suited to concentrated, high-speed training. 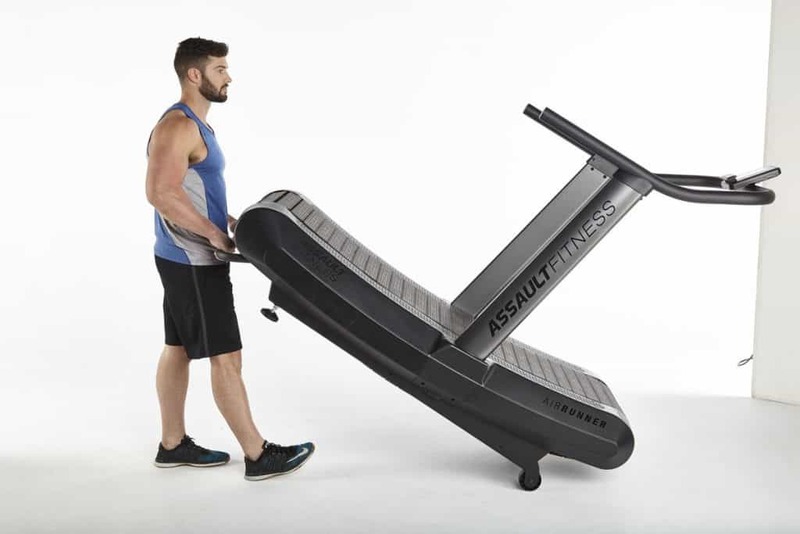 A manual treadmill like the Assault Fitness AirRunner or the TrueForm Runner is a good choice (but an expensive choice) for a home or garage gym. We hope we’ve provided helpful information for you to make your buying decision. You might also be interested in our articles on indoor rowing and air bikes. Both of these also provide an efficient total body workout with low impact. 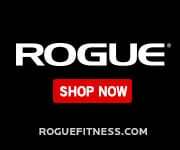 The Rogue Fitness logo and some product imagery on this page is property of Rogue Fitness and provided by Rogue Fitness. This website is not affiliated or associated with CrossFit, Inc. CrossFit is a registered trademark of CrossFit, Inc.
New Year’s Resolution 2019 – Tips for Fitness Success.